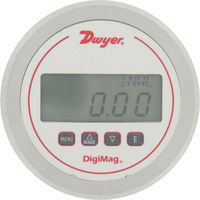 The DigiMag® Series DM-1100 Digital Differential Pressure Gage monitors the pressure of air and compatible gases just as its famous analog predecessor the Magnehelic® Differential Pressure Gage. All models are factory calibrated to specific ranges as listed in the chart below. The 4-digit LCD can display pressure readings in eight common English and metric units so conversions are not necessary. The simplified four button operation reduces set up time and simplifies calibration with its digital push button zero and span. The gage may be powered with 9-24 VDC or 9V battery alone when power is not available. A-480 - Plastic static pressure tip. Selectable Engineering Units: in. w.c., psi, kPa, Pa, mm w.c., mBar, inHg, mmHg, FS (0-100%FS).